Adhesions, a form of scar tissue, are the abnormal adherence of collagen (which is a type of connective tissue found in the body) to structures that surround those fibers. Scar tissue and adhesions usually form after a period of immobilization or after some type of trauma. Scar tissue formation is a mechanism by which the body repairs damaged tissues. When tissues in the body are interrupted by injury or impact, scar tissue forms as part of a several stage wound healing process. Scar tissue (and depending on how long it's been since the injury occurred, its precursor substances) help mend together the separated ends of the disrupted tissue. Scar tissue is analogous to a scab that forms when you scrape your skin, except that it is found internally in the body. Scar tissue and adhesions can cause pain. According to the website, Emedicine Health, most of the time, the pain related to adhesions is not due to the adhesions themselves but rather the effect they have on nearby structures. Scar tissue formation may become so severe that removal surgery is needed. But most of the time, working with a doctor and/or physical therapist to address the pain (which includes pain due to inflammation, as well) will do the trick. But a cross friction fiber massage is not your typical massage. It's more like work than relaxation, but done properly, can help speed healing in the short run and give you back full usage of the affected joints in the long term. Among other techniques, in a cross fiber friction massage, the therapist uses a few fingers transversely across the scar tissue. The action is a bit like sawing. 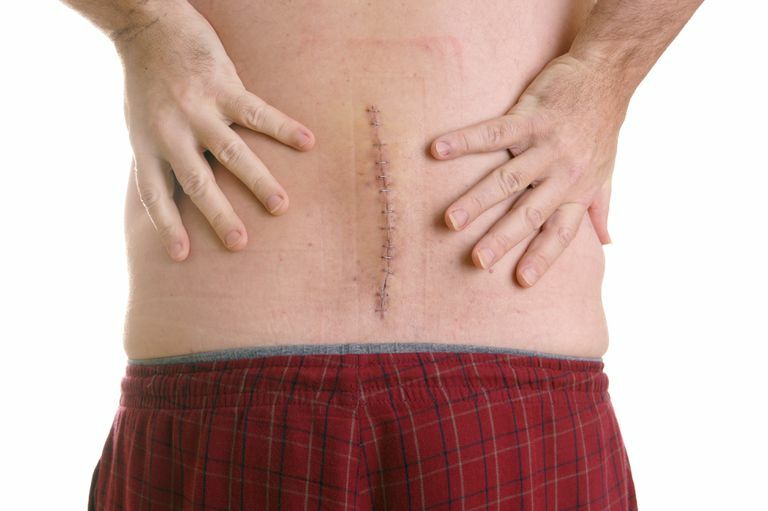 Scar tissue formation occurs after back surgery - it's a normal part of the process. People who have experienced multiple back surgeries tend to have more adhesions – every time the doctor goes in with the “knife,” tissues in the spine are disrupted and need to be reunited. Minimally invasive spine surgery uses only a very small incision through the skin, and expansion of tissues found under the skin is less. The result is the formation of fewer adhesions as compared to traditional back surgery. Cross Friction Massage. Physiopedia Website. Adhesions, General and After Surgery. EMedicinehealth website. Lodish, Berk, Zipursky, Matsudaira, Baltimore, Darnell. Molecular Cell Biology. Fourth Edition. W. H. FREEMAN. 2000. New York. Moore, K., Dalley, A. Clinically Oriented Anatomy. Fifth Edition. Lippincott, Williams & Wilkins. 2006. Baltimore. Kisner and Colby Therapeutic Exercise, Foundations and Techniques, 4th ed. F.A. Davis Company. 2002. Philadelphia. Mosby's Medical Dictionary. 7th edition. 2006. Mosby Elsevier. St. Louis, Mo.